So Wings has just left USA Network as we mentioned, but it has quickly found another cable home. ReelzChannel TV has picked-up the rights to air the '90 sitcom and will begin airing it on Tuesday, Jan. 3. The sitcom will air in better time periods than the filler style airings it was getting on USA Network. ReelzChannel TV will air it weekdays at 2:00pm & 2:30pm ET and it will encore in the late night at 1:00am & 1:30am ET. The sitcom joins the ReelzChannel line-up filled with other '90s style comedies. To recap their schedule, they have Spin City in the 9am hour, followed by an hour of Becker, a half-hour of 3rd Rock from the Sun at 11am, then a break for an original series, an hour of Cheers at 12 noon, then another hour of Spin City at 1pm leading into Wings at 2pm. Then at 3pm we have another hour of Cheers, followed by a triple shot of Coach from 4-5:30pm. An original series follows, then the 6pm hour has more Becker and the 7pm hour has back-to-back 3rd Rock from the Sun. Movies air in primetime at 8pm and 10pm, then sitcoms return at 12 midnight with yet another hour of Cheers leading into Wings at 1am. More originals air after that from 2-4am, then paid programming rounds out the night until 7am. On weekends, for sitcoms we have Spin City at 10:30am, followed by an hour of Wings at 11am. Then sitcoms return in early evening with Becker at 6pm and Cheers at 7pm. Cheers also airs in late night if a movie doesn't go over, anytime after 10pm. 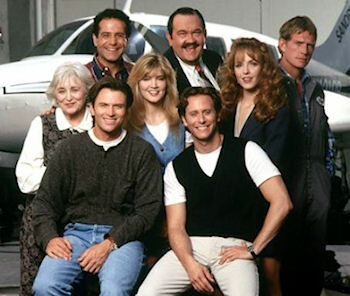 With the addition of Wings, ReelzChannel has a nice group of similar style sitcoms that ran in the 90s. Perhaps for the future they could add more sitcoms like Night Court, Mad About You, Suddenly Susan and Caroline in the City? They would certainly fit. Anyway, for now it is just the addition of Wings to a nice sitcom line-up. Get on board for Tim Daly, Steven Weber, Crystal Bernard, David Schramm, Rebecca Schull, Thomas Haden Church, Amy Yasbeck, Farrah Forke, and Tony Shalhoub. Stay with us for any further updates. We told you ION Television has acquired the drama Cold Case, but now we have a start date and timeslots! The crime drama will launch on the network on Monday, Jan. 9, 2012 and air at 7pm, 8pm and 9pm. The drama will air in these time periods on Mondays, Wednesdays and Thursdays. On Fridays it will air in a four episode block from 5pm-9pm and then back-to-back at 11pm & 12am. ION will be airing 15 episodes per week (with six of those on Fridays). The drama joins a line-up of other dramas like Criminal Minds, Ghost Whisperer, Monk, Without a Trace, Flashpoint and Psych. ION also airs sitcom George Lopez and theatrical movies. There are no other real schedule changes besides the addition of Cold Case.